Its been a while between posts. So many things to do and the garden was left to its own devices. The choko vines took over the backyard for a while and gave an abundance of fruit. 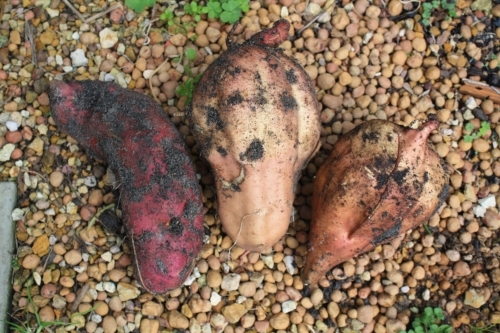 Yesterday I got to spend a little bit of time out in the garden and decided to bandicoot around for some sweet potatoes. I was happy to find the above harvest which we had roasted for dinner and taste tested with a visiting friend. 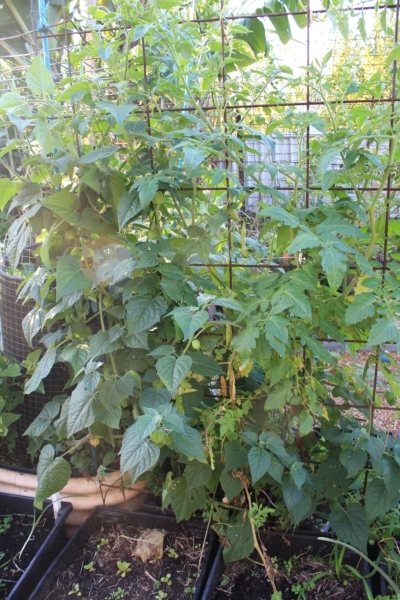 This little jungle of tomatoes and cape gooseberries has been growing steadily through the cold winter temperatures and making the most of the bright sunny days we have been having. We have had a small harvest of cherry tomatoes over the last week. You can also see a few bean pods that are left to dry. These were planted in early autumn and gave a small harvest, most of which I have left for seed saving. Our chooks began laying again about a month ago and are gifting us with an egg or two a day. The koi are growing well and looking really nice in their dark pond surroundings. We have been taking a small helping of salad greens from the garden each day. Enough to garnish or enhance a curry or a lunch salad.